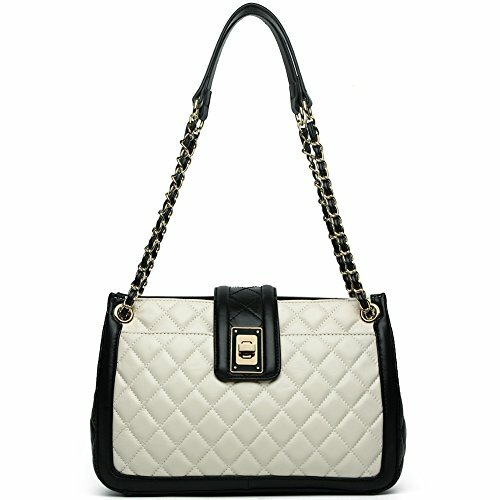 Our brand is focusing on offering top grade classical fashion genuine leather handbags. We are the manufacturer which is specialized in genuine leather products for men and women, including wallets, purses, backpacks, handbags, clutch bags, briefcase and messenger bags etc. We have professional development of designers and quality supervision team, dedicating to provide 100% fine customer service, excellent products, affordable prices and fast delivery. Make every effort to make every customer get a good shopping experience here. Please allow the leather smell of unused and brand new product; the smell will disappear in a few days air out. Please allow the slightly colors differs between the actual product and the web photos because of the monitor settings discrepancy. Please confirm the dimensions according to our description instead of the photos and allow within 1" differs due to manual measurement. If you have any other questions, please feel free to contact us! SELECTED MATERIALS: Top grade Lambskin and cotton-blend lining with exquisite hardware. ANA LUBLIN is committed to using advanced materials to bring the good design into reality. FUNCTIONAL STRUCTURE: 1 main compartment + 1 inner separated zip pocket + 1 inner zip pocket + 2 inner slip pockets + 1 back pocket + 1 front pocket, this good organizer design can hold you stuff tidy and orderly. SUITABLE SIZE: 12.99(L) x 4.53(W) x 8.27(H) inch, the maximal strap height is 13.78 inch, this is a bag with ideal size suit for most ladies, not too big or too small, just fit, a smart lady's choice. MULTI-BENEFITS: Neat enough, this classical fashion cross body bag goes well with any outfit in any occasion like party, wedding and dating, classic accessory for your evening ensemble. Perfect gift idea for you or your friends! ELABORATE HANDCRAFT: Finest quality hand made by professional artisans with more than 20 years of experience. Excellent design, exquisite workmanship and high practicality are the common features of ANA LUBKIN brand bags, to select more handbags, cross-body bags, purses and wallets, you can click the WESTBRONCO in blue color. If you have any questions about this product by ANA LUBLIN, contact us by completing and submitting the form below. If you are looking for a specif part number, please include it with your message.